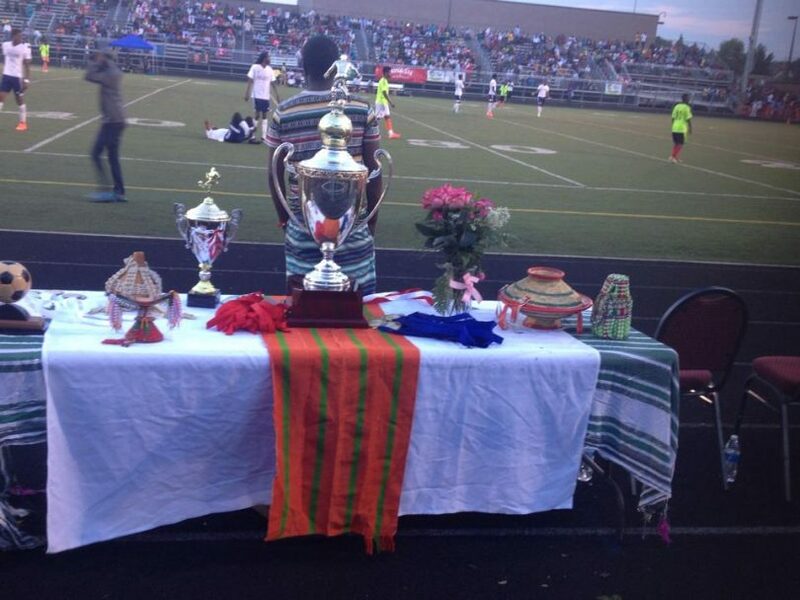 (OPride) — The 18th annual soccer tournament organized by Oromo Sports Federation in North America (OSFNA) held from Aug. 2-9 in Minnesota wrapped up last weekend after what has been described as the most successful event in years. Minnesota’s Oromo United (OU) was crowned champions in front of a roaring home audience. Utta Wayyuu, also of Minnesota, the 2008 champions who have made several semi-final appearance since 2004, came up short against a formidable OU side after booting the defending champions, Madda Walabu of Seattle out of the game the day before. The final three days of the tournament was filled with upsets and a lot of drama. The local favorites Dire Dawa and Burqitu of Denver made unceremonious early exits while Oromia 11 Stars, the 2011 champions, and Minnesota’s TTL only managed a group stage. Qeerransa of Portland and TTL Stars, the youngest of all division A teams, were the most improved; whereas OU Gold and Risaa, both of Minnesota, were the worst performances. Although OSFNA did not give out a coach of the year award, many fans and spectators noted Abdulfatah Wabe of TTL Stars was one of the most disciplined and improved coaches of the tournament. Oromia of Australia’s addition to the 2014 OSFNA lineup made the tournament the first truly international sporting event (previous tournaments featured only North American teams), and brought a unique game and enthusiasm to the event. The club’s dedication to come all the way around the world and their discipline on the field earned them much appreciation from fans. Their final game against eventual champions OU was one of the most evenly contested matches of the week. If the Australians failed to go home with trophy, they made certain to go down fighting hard. OSFNA watchers have credited the reforms undertaken by the organization for the renewed momentum and the improvements in the management of events. At the conclusion of last year’s games, the general assembly and then outgoing board elected a new president, a young player, who was joined on the board by equally younger peers. It was almost unprecedented in that most of the board members were new comers, but it signaled a promising turn for the federation. The federation took a number of notable steps to improve the experiences of players and fans in this year’s tournament. For one, the team registration fee of $1000 was cut in half, awarding each team a $500 refund for showing a good sportsmanship. OSFNA also worked closely with team leaders to communicate the steps it was taking to improve the tournament experience. This year’s tournament boasted 19 clubs, compared to only 13 last year. The 2014 tournament drew the kind of attendance not seen since 2008. But perhaps more importantly, it brought back a much-needed momentum that has been on the decline. That’s not all. Compared to previous tournaments, the 2014 games seemed better organized and introduced many new activities. As previously reported, a women’s soccer, Abebe Bikila memorial race, a halftime cultural performance by local youth during the opening and closing games and various sports competitions among fans were added for the first time this year. In large part thanks to sponsorship from local businesses, OSFNA gave out almost $13,000 in prizes to this year’s winners, according to Hassan. Not only did they award division A and B winners, the top three teams also received higher bonuses than previous years. While previous champions received $1,000, this year’s winners took home $3,000. Second place winners Utta Wayyuu received $2000, while third place runner ups 10, 000 Lakes Stars were awarded $1000. Continuing its pledge of transparency and accountability, OSFNA is working on itemized financial report that would be shared with the general assembly and interested parties in coming weeks, according to Uka. The change in leadership or perhaps the style of governance seems to have made a significant difference. First, beyond limited marketing to soccer clubs, there have been concerted efforts to improve outreach to the local community. For example, last December OSFNA held a public briefing at the Oromo Community of Minnesota to share its plans for this year’s events. There was also ongoing publicity on social media and through the group’s revamped website. (There’s actually an official letter from the president laying out his vision and theme for the tournament!) OSFNA’s newly redesigned website is colorful, inviting, informative and most of all user friendly. 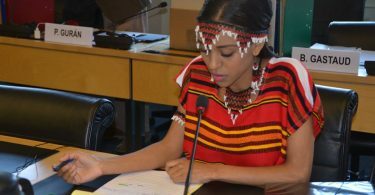 Overall, from outreach to local police and elected officials in order to get the week to be officially proclaimed as “Oromo Week” to securing the field, OSFNA leaders appeared more proactive in working with community leaders, particularly the OCM and the OSFNA board of trustees. Furthermore, the presence of the first ever medical team on hand to attend to injuries underscores OSFNA’s commitment to community outreach. It’s indeed an important step forward in leveraging the human resources within the Oromo community in the diaspora by inviting professionals to volunteer at the games in their respective areas of expertise. While the attendance of U.S. 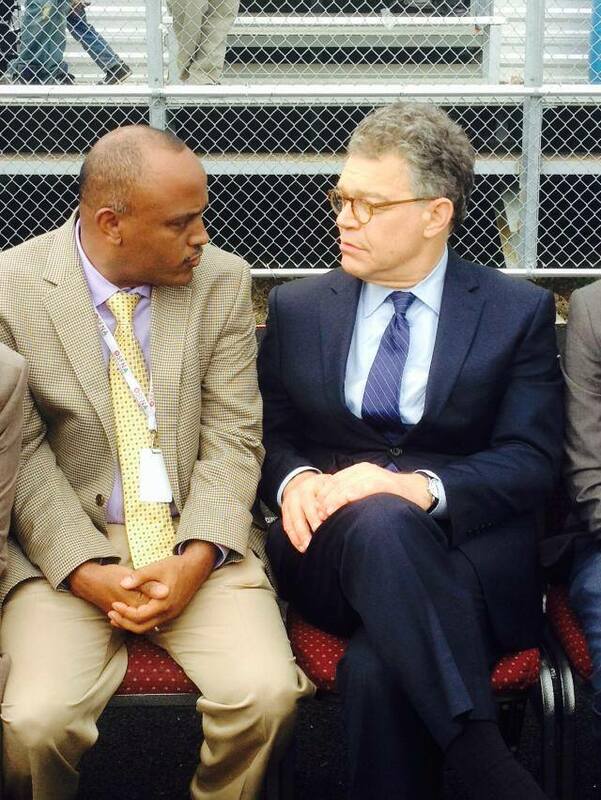 Senator Al Franken was a recognition of the contribution and growing influence of Oromos in Minnesota, the presence of a delegation from Oromia led by retired Abba Gadaa of Guji, Aaga Xanxano, who’s touring Oromo communities in the U.S., added more color to the event. Asked about the challenges the board faced in organizing this year’s tournament, Hassan highlighted two points. Financially, the organization was strapped, and had to seek sponsorship from multiple sources in order to secure the soccer field at the cost of $30,000. 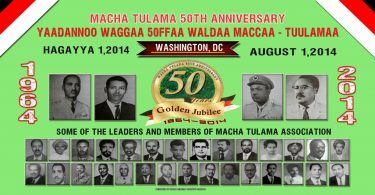 Another major challenge OSFNA faced was securing major partnership agreements with other Oromo week event organizers. For example, discussions with local concert promoters failed to materialize after months of negotiations when the planners failed to agree on how to share profits by co-hosting the closing night party at venue. While it has always been controversial, OSFNA historically hosts the closing party, but, while not the first, disagreements among the organizers resulted in two separate concerts being held this year. Founded in 1996, in recent years OSFNA has faced criticism for disorganized events and a glaring lack of capacity to mobilize local resources, including volunteers. Despite these notable improvements, however, some of the past institutional dysfunctions remain. In other words, OSFNA’s young leaders have a unique opportunity to institute more changes before their term expires in 2015 to make the tournament even more orderly and colorful. While the focus this year seems to be on the Oromo community, the tournament offers an unparalleled opportunity to teach others about Oromo people, and to introduce Oromo people to their neighbors. There’s a significant deficiency on this front. For instance, with a clear-eyed and strategic outreach, especially considering the attendance of a U.S. Senator and official recognitions by mayors of Saint Paul and Minneapolis, the event should have generated significant mainstream media coverage. In addition to doing away with proposed suggestions to limit access by Oromo media outlets this year, OSFNA leaders should aggressively pursue local media to cover the Oromo week events. 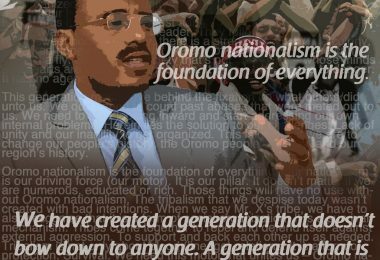 Generally, OSFNA leaders should partner with Oromo media outlets to formulate strategies on how to increase publicity and also coverage of its events across various social media platforms. For example, OSFNA should have taken part in promoting or utilizing OPride’s annual social media campaign platform. (It is an open invitation for next year!) This simply means using OSFNA’s Facebook and Twitter pages to post updates throughout the week in order to get people excited about the games and to attract more attendance. The Oromo week brings together soccer players, fans and Oromo artists from around the world. It is a unique opportunity to work with Oromo musicians to organize a live performance at the field at least during the opening and closing games. There is no doubt that this would be costly and will take time to put together. But it can be done with a little more creativity, collaboration and hard work. For starters, OSFNA doesn’t have to attempt to pull off this show alone. It can work with various Oromo promoters, community organizations and Oromo and non-Oromo local businesses to sponsor such performance. It could also raise the entrance fee for the opening and closing games. 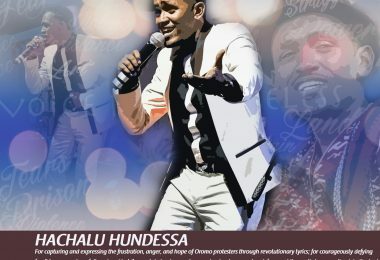 At the worst case scenario, OSFNA should have invited Oromo artists to perform the unofficial Oromo national anthem it has adopted this year. It seems as if OSFNA had fewer vendors than previous years. There’s only one music shop, one food option and one shop for custom-made items. OPride is not privy to the details about how OSFNA vets potential vendors. But theoretically, more vendors mean more money for the organization (which according to insiders suffers from a chronic funding shortage). OSFNA should court more Oromo and non-Oromo businesses to display ads around the stadium during the week. Among others things, OSFNA should also invite publishers of Oromo books and Oromo cultural cloth shop owners to participate. Cover photo courtest of Surraa Tolosa.